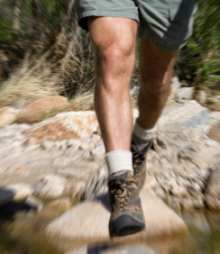 Shin Splints, or Tibial Tendonitis, can be mildly annoying or utterly disabling. If you're lucky it will go away with rest. But if you're a runner and have shin splints and want to run....you better learn how to fix the problem. It doesn't matter if the pain in your shins is new or old. The Tendonitis Dynamic of shin splints is reversible and is curable. What is a shin splint? What Is Tibialis Tendonitis? Shin splints can be just as disabling as a ruptured achilles tendon or ACL injury. This shin injury develops exactly like Tendonitis does, but shin splints have their own personality quirks due to their location and various structural aspects. The muscles on the anterior (front) of your shins lay close against the bone. Focus on the tendon of the Tibialis Anterior muscle that is a thin connective tissue attachment where muscle meets bone along the length of your shin (tibia) bone. The connective tissue that wraps the bone, periostium, can get irritated, inflamed, and can potentially get rip and tear injury if to much force is applied by the muscle (over and over during exercise. This inflammation of the periostium is the REAL problem with shin splints. It's the SECRET cause of excruciating shin splints pain. As in all cases of Tendonitis, when you get some wear and tear microtrauma to the connective tissue and tendon of your shin muscles, you get Inflammation and a Pain Causing Dynamic. In fact, the Pain Causing Dynamic was already there. First you were active running or walking over a period of time, and your muscles got tight, then too tight. The tighter they got, the more stress they put on the supportive structure every time the contract. Then one day you did 'too much', and you painfully discovered that you had a shin splint on one or both legs. Injury. Ouch. My point is, you already had something going in in your shins and entire lower leg structure before you started hurting. The day you started hurting was just the day your started to actually feel what had already been going on a good long while. Anytime you put more strain on your shin structures than they are strong enough to handle you can injure (or just irritate, which can be just as bad) yourself. And, the tighter those muscles get, the less able they are to perform work. So the tighter the structures are, the less able they are able to deal with the strain you put on them. And then sooner or later, pain shows up. And when shin injury pain shows up, you'll KNOW it. I say 'shin injury' loosely, as it's really more a function of TOO TIGHT and TINY MICROTEAR. And then of course all the inflammation and pain enhancing chemical that results. A Shin Splint phenomenon is primarily a Tendonitis dynamic affecting the muscles attaching to the Tibia bone of the lower leg. Feel free to call it Tibial Tendonitis. It's an inflammation of the tendon (and other tissue) of the Tibialis Anterior muscle. But you also have to deal with Periostitis (don't worry, it sounds worse than it is). It started so small you didn't feel it for a long time until all of a sudden you did and thought that you got injured somehow. In other words, shin splints develop over time. A lot like Carpal Tunnel Syndrome, but in a different location, obviously. Severe Shin Splints can trigger Anterior Compartment Syndrome. Bad anterior Compartment Syndrome results in shin splits, literally. Bad news. Both severe Shin Splint and (chronic) Anterior Compartment Syndrome are painful and problematic. They are both relatively simple to deal with (depending on the severity), and prevention is your best option. Chronic Compartment Syndrome is what I will be talking about on this site. Acute Compartment Syndrome is a threat to life and limb and requires a trip to the Emergency Room. From too much running or walking (or other associated activity), the Tibialis Anterior muscle gets overworked in the long run or the short run and wear and tear injury happens. This kicks in Inflammation and a Pain Causing Dynamic that continues to make the muscles tight. Then when your go for a walk or run, you feel pain and get more wear and tear damage. This is how it builds on itself and gets worse over time. If you get kicked or take some other blow to the front of the shin, the resulting pain and stiffness -technically- isn't shin splints. But the mechanisms that are in place around the injury -are- the same, so the symptoms are pretty much exactly the same. With a blow and associated bruising, one then has to worry about Anterior Compartment Syndrome. Do you think that healing shin splints will just happen over time with plenty of Rest? Think again. Rest and 'time off' rarely heals shin splints. It is common for people to take months off, and when they start jogging or running again....HELLO SHIN SPLINTS! At a deeper level, call it a shin split. Meaning, the muscle is so dense and tight, and the connective tissue surrounding it is SO tight, and the connective tissue that wraps the bone that connects to the too tight connective tissue around the too tight muscle, that when you add too much force to that, it rips and tears. This shin split can be micro-sized, or bigger. For most people, it's tiny micro-trauma. But it adds up, and eventually keeps you from being able to walk or run due to the above mechanism: tightness --> inflammation --> pain -->more of the same. * Pain in the shins when walking or running. * Quickly increasing pain when walking or running. * Little to no pain when not walking or running. * Pain when contracting the Tibialis Anterior muscle (the shin muscle). * A variety of pain sensations, from an ache to deep pain to shooting pain to constant or intermittent pain, etc. For a more in depth explanation of what exactly is causing each shin splint symptom, see the Shin Splint Symptoms page. The best way to shin splints treatment is to Prevent Shin Splints before they happen. Whether you are a high level athlete or a weekend warrior or have a stand on your feet all day long job, there are a lot of treatment options out there, but here you will find the most effective Shin Splints Treatment options. And if you want a complete plan, a no-frills walkthrough on why you have Anterior Shin Splint pain, and how to REVERSE the process and get out of pain, then go to the Reversing Shin Splints page. Return to the top of this Shin Splints page.